Coeur d'alene, Idaho is a perfect place for a destination wedding in the stunning northwest. One of the most beautiful venues is the Cda Resort Golf course location on the waters edge in Coeur d alene. 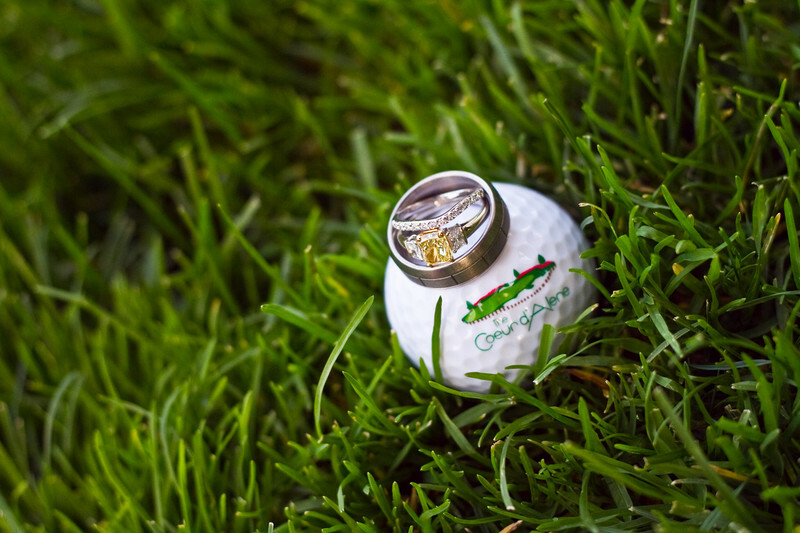 Not only is it a world renowned golf course it is also a great place to exchange nuptials. Like most days in the summer in northern idaho, the weather is wonderful. Sunny and close to 90 degrees on a daily basis. With this photo, I wanted to capture the essence of the wedding, yet the location at the same time without involving anything except the wedding rings and a golf ball. I believe this image could be a great advertising image for the resort. When I think of a golf course I think luscious green grass. The golf course is known for the only moveable floating golf green in the world. It is their logo and is placed on their merchandise. I believe you can get the idea of what a great location this is to get married by the natural elements of this picture as well as the rings and advertising. Whether you are a local or a couple planning a beautiful destination wedding, you should look up the cda resort golf course. The views are stunning and the accommodations are impeccable. Location: 900 S Floating Green Dr, Coeur d'Alene, ID 83814. Keywords: cda best wedding venue (3).